Want to spend a great day on the water without going through customs? Consider a St. John Boat Rental and cruise around the stunning island of St. John! 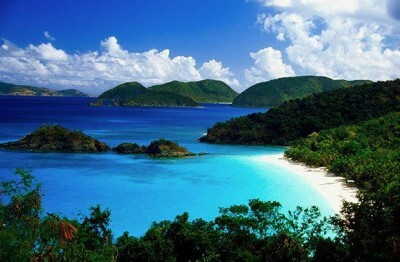 St. John is one of the four U.S. Virgin Islands, and is probably the most well known of any Caribbean Island from its iconic photographs, but one of the least known Caribbean islands by name and location. Just a few minutes from the hustle and bustle of St. Thomas, the small island of St. John is about 75% National Park land, which means this perfect island paradise will never be overdeveloped or commercialized. Best known for dozens of postcard perfect beaches and fantastic snorkeling, St. John is home to wild donkeys, deer, iguanas, and mongoose, visible all over the island. In addition to its beaches and wildlife, St. John is also home to some of the world’s most incredible sugar mill ruins—a holdover from the island’s days of sugar plantations in the late 1500’s and early 1600’s. When planning your St. John Boat Rental, plan on some amazing snorkeling, because snorkeling and diving around St. John are unmatched. Trunk Bay, on the west side of St. John, offers an underwater snorkeling trail that is marked by placards that show you what aquatic life you’ll encounter in these gentle, shallow waters. The best snorkeling, hands down, is at and around Waterlemon Cay. Here, you’ll find exotic rays, colorful starfish and graceful Sea Turtles at every turn. Soft coral formations cover the sea floor for what seems like miles. The water is warm and the tides are usually gentle here; this is a must do for avid snorkelers. There are two small towns—settlements really—on the island of St. John. The main town on the west end is called Cruz Bay, and if you are staying on St. John, this is where you’ll pick up yur St. John Boat Rental (at the National Park dock). Cruz Bay is where the ferries from St. Thomas dock and most of the commerce can be found. There are no franchises or chains on St. John (save for a couple of hotels)—just local flavor and flair. Instead of cheesy tourist traps, St. John is full of imaginative shops filled with one-of-a-kind items. Cruz Bay is loaded with art galleries and studios, and life on the island is focused on health, wellness, and well being. On the east side of the island, you’ll find Coral Bay, a sleepy little sea village with a couple of great local restaurants. Coral Bay is where the locals go, and it is incredibly charming. Coral Bay harbor is a protected harbor where locals live aboard their boats. Locals say the best thing about Coral Bay is how they take care of each other, so you know you’ll truly get a feel for unusual island life with locals like these! If you want to see the quintessential Caribbean island, which has graced more travel magazine covers than any other island, plan to visit St. John on your St. John Boat Rental.